The Ped Shed, a blog focused on walkable urban design and sustainable placemaking by Laurence “L.J.” Aurbach, recently had a post about density as a best management practice (BMP). The post provides a good outline of the evolution of the stormwater regulatory environment. 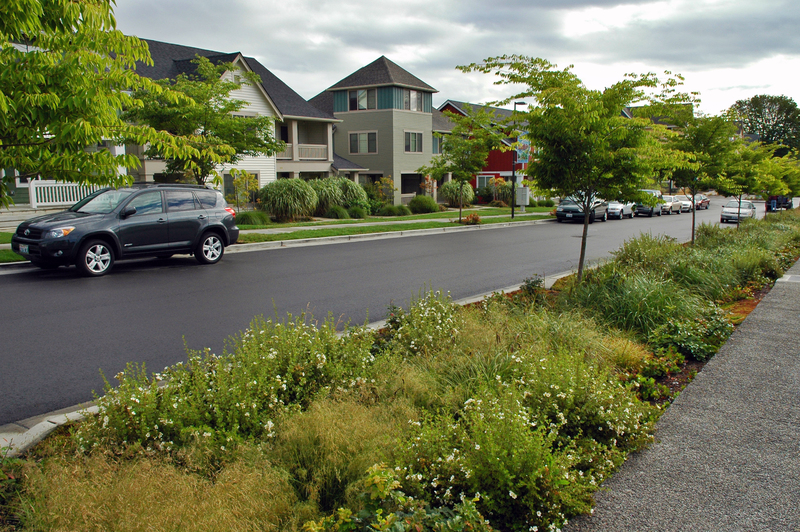 The main point of the post is that well intentioned stormwater regulations make it difficult to build dense walkable environments that ultimately exacerbate stormwater management issues. He cites three studies, two by the EPA (Protecting Water Resources with Higher-Density Development, Using Smart Growth Techniques as Stormwater Best Management Practices) and one by Jacob and Lopez (Is Denser Greener? An evaluation of higher density development as an urban stormwater quality best management practice.) All of them provide compelling data as to the benefits of density with regard to stormwater run-off and pollutant loads, and are well worth reading. I agree with him that when developing an urban vs suburban site, more expensive stormwater BMPs are typically utilized (i.e. underground detention, green roofs) to meet stormwater regulations. However, site area, property costs, and market dynamics are a large factor in determining appropriate BMPs and cost effective solutions. If you can build significantly more square footage due to a better market environment and/or need to maximize your investment in land cost (which often reflects the market potential and property entitlements) then the cost of best management practices that maximize these potentials can be offset. The examples of offsite mitigation are very intriguing. I wholeheartly agree that opportunities for this on properties in close proximity to the development is an effective way to mitigate stormwater impacts while spreading (and hopefuly lowering) the cost across multiple properties. In regard to infill developement, this can be very difficult in practices but not impossible. Public space can be designed to accommodate the needs of neighboring properties. Using green roofs, pervious pavements, and other BMPs on surrounding properties can greatly reduce the volume of runoff being diverted to these offsite areas and therefore their size can be diminished to a point that can be integrated better into urban environments.